French macarons, no fail! A small batch of French macarons made with a secret ingredient from a pastry chef for perfect results, every time! There is a little-known secret in the macaron world about how to achieve perfect macarons, every single time. This one little trick takes them from finicky to perfect results on the first try. I learned it from one of my baking idols, Anne Thornton. She used to have her own Food Network show, and I’m still sad about it being cancelled. 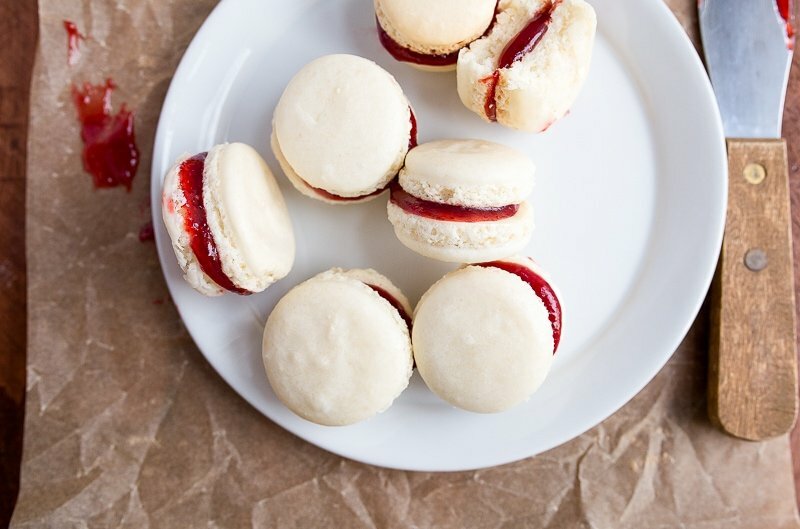 She shared this trick for perfect macarons, and I’ve been a devotee ever since. Anne’s trick is to add 1 tablespoon of meringue powder for each egg white. The meringue powder stabilizes the egg whites, and helps them thicken properly so that you get perfect macarons, even on your first try. I’m serious! Go check out the comments on all of my macaron recipes–they’re full of people in shock that the recipe worked. Last week, I decided that this trick meant I was ‘cheating’ at macarons, so I tried another well-known recipe on the internet. It failed so miserably. Twice. And I used the f-word on instagram because of it. It was a dark, dark week. However, I’m back to only using this recipe for macarons, and now I don’t need soap for my mouth. I actually doubled the recipe the other day, just to see if it holds true. It does. Even though meringue powder requires a special trip to the store, it’s a lot closer than my local patisserie. Meringue powder is essentially just dried egg whites. It’s easy to find at a hobby or craft store because cake decorators make fondant and royal icing with it. You can scale this recipe up or down, just make sure to add 1 tablespoon of meringue powder for each egg white. Speaking of egg whites, they should be old. Separate your egg(s), cover the whites, and age them in the fridge for at least a week. When you’re ready to bake, let them come to room temperature on the counter for a few hours. How do you pronounce macaron? Do you know how to pronounce ‘macaron’? I saw mack-a-ron, like my friend ‘Ron.’ But I hear ‘macaroon’ all the time, even in French bakeries. For Christmas, I bought myself a macaron kit. (Yes, I always buy myself gifts, and I see nothing wrong with it). The kit had a rubber mat to help you pipe out perfect macs and this little brown squeezy thing (photo below) to help you pipe. The rubber mat let me down–it actually curled with the heat of the oven and made macarons slide everywhere (another reason I used the f-word last week), but this little brown squeezy thing, I love. I love that you can load the batter into a large area (just unscrew the clear part), and the tips are so easy to attach and clean. It actually came with a lot of tips, and I want to try it out for cake and cookie decorating. If you don’t have a speciality piping bag, just use a ziplock bag (try to use a sturdy freezer-safe one), and snip the tip off to make a homemade pastry bag. The best part about using a ziplock bag is that you don’t have to clean it up, just toss it in the trash. One more little thing about these cookies: the batter is thick. While it seems hard to squeeze out because it’s so thick, it will still settle into perfect little circles. Hold the bag/squeezy thing directly over the baking sheet, squeeze until you have a cookie about the size of a fat Hershey’s Kiss, and the move on to the next cookie. While you pipe the whole sheet, the circles should flatten out and relax a bit. One more fool-proof tip for this recipe: after you pipe out the cookies, you’re going to let them dry before baking. It seems weird, I know, but if you let the cookies set out until the top is no longer sticky, they will bake up perfectly. 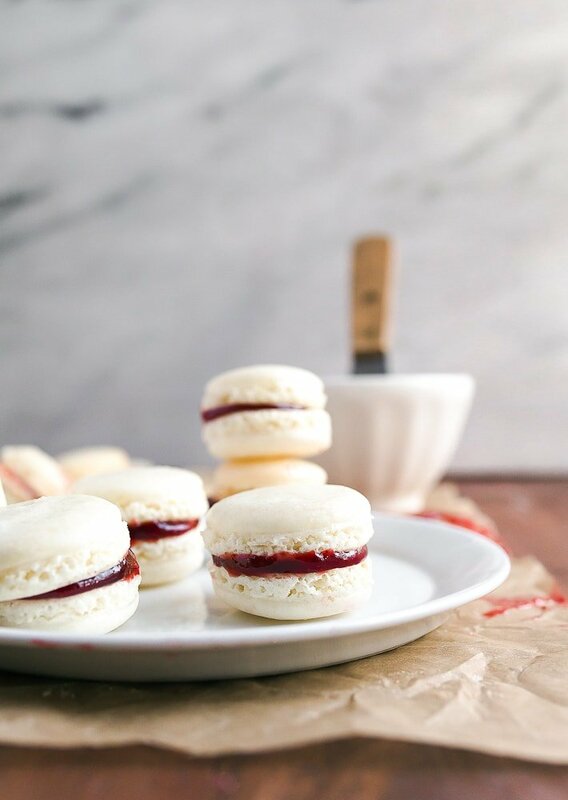 I really really really hope I’ve convinced you to try homemade French macarons. I promise with everything I have that this recipe will work for you. The meringue powder tips makes them very forgiving, and the low temperature bake helps them bake slowly and evenly. If you follow this recipe exactly and it fails for you, I’ll buy you dinner. Deal? I’m going to paste the recipe below for a double batch, but if you need to make an even smaller batch and just use 1 egg white, feel free to scale it down. And oh yes, I still have small batch strawberry jam in my fridge from failed strawberry pâte de fruit, so that’s what I stuffed these with. Feel free to use Nutella, caramel, or stir some jam into buttercream. It’s hard to go wrong here–fill the cookies with your dream filling. Happy perfect little French macaron feet to you! 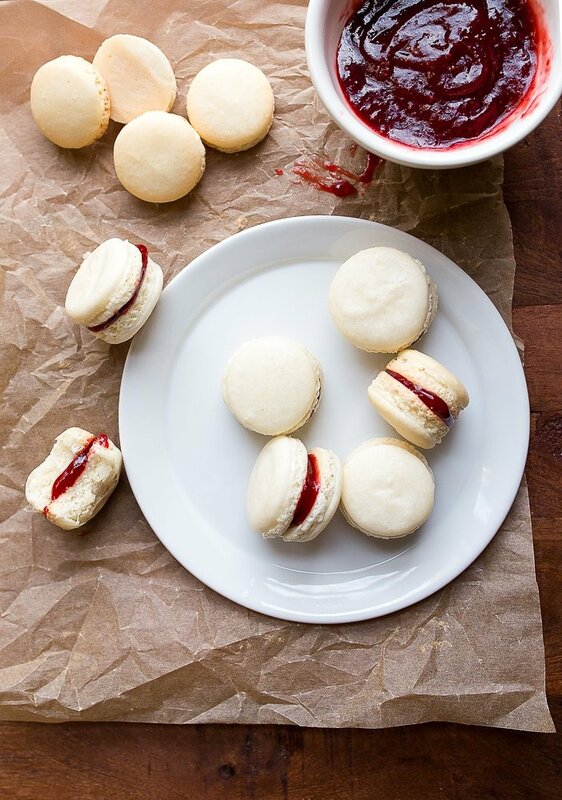 A recipe for fail-proof macarons with a secret ingredient to ensure perfect results every time! First, let the egg whites come to room temperature in a medium bowl. 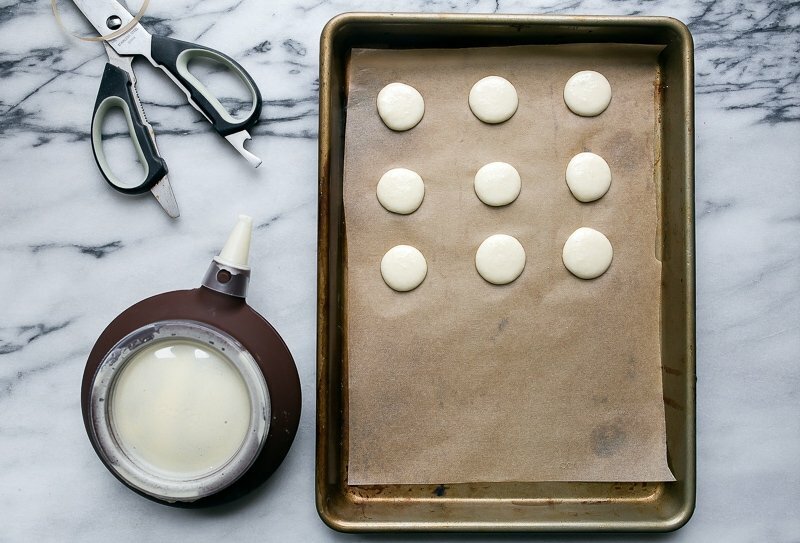 Line a baking sheet with parchment paper (it works better for me than a silicone mat when it comes to macarons). Make sure the paper fits into the pan perfectly--any buckled paper around the edges will make the cookies spread unevenly and slide. Meanwhile, sift together the almond flour and powdered sugar into a medium bowl. Begin to beat the egg whites on medium speed using a hand-mixer until foamy, about 10 seconds. Then, start slowly adding the meringue powder while constantly beating. Beat the egg whites and meringue powder until soft peaks form, about 1-2 minutes. This will depend on your mixer speed, but be careful not to over-mix. The peaks are soft when you lift the beaters and the egg whites flop over. Once the egg whites have soft peaks, turn off the mixer. Add 1/3 of the almond-sugar mixture and begin to gently fold it in using a small spatula. Take your time: proper folding technique is carefully folding around the sides and cutting through the middle occasionally. The idea is to not stir too hard and deflate the air you just whipped into the egg whites. Repeat with the remaining almond-sugar mixture two more times, until completely incorporated. Finally, stir in the vanilla. Scrape the batter into a piping bag with a 1/2" tip (or use a plastic bag with the corner snipped off). The batter will be thick. Pipe the batter into 1" little mounds (about the size of a large Hershey's kiss), and let sit. While they sit, they should flatten out. Leave 2" between each cookie for air circulation. Let the cookies rest on the baking pan for at least 30 minutes. Test to see if they are tacky--if you touch the cookies gently and the batter sticks to your finger, they're not ready. They should be dry to the touch. On humid days, it can take 45 minutes. Meanwhile, preheat the oven to 300 (or 290 if you have a gas oven that runs hot like mine). Bake the cookies for 13 minutes, until their little feet have risen and the tops are dry. Remove from the oven and let cool near the oven (drastic temperature changes can cause cracks). Once cool, pop the cookies off the sheet, spread with jam and sandwich together. *To age your egg whites, separate the whites from the yolks, cover them and refrigerate for at least 1 week. Before using, let them come to room temperature. Just bought meringue powder on Amazon, so excited to try these! The flavor of a macaron is so delicate. Do you find you can tell a difference in the cookie’s flavor with the meringue powder added in? sososo excited to try this. i’ve made 6-7 batches of macarons over the past 5ish years, and haven’t had more than half a batch turn out despite watching all the videos and trying different ratios/methods. and i even have meringue powder (unopened, too) in my pantry for whatever reason. This is wonderful! Macarons have foiled me once, and I’ve yet to give them another try. Also, down with that baking mat! I think maybe we got the same kit, because when I used it, there was nothing but a pool of mix everywhere. But did I stop there? No! I put it in the oven where it continued to drip down the sides! Isn’t that terrible? Just terrible. And I’ve never tried again since. Fool me once, macarons! But with all these tips, I might just have to bite the bullet and try again :) Thanks, Christina – you rock! Does this make 2 dozen sandwiched macarons or 2 dozen macaron cookies? I’m intrigued to try these; however, I see you have measurements in grams. Do you have the equivalent “standard US” measurements? Is this a quantity or weight? Thanks, I don’t bake much and I never bake from scratch! Hi Karyl, I’m sorry, I do not. These cookies can be very finicky and the only way to guarantee results is to weigh the ingredients. I’m sorry! Do you have a kitchen scale? Well, Butter My Buns! I have been so wanting to try my hand at macing Macaroons for a while now, but was literally terrified. I have read, and read, and watched video after video and became even more anxious to even try. Well, I think I can do this now! Thank you so much! I’ll report back as soon as I make them. Yippee! I just found Wilton Baking Powder at Walmart.Less expensive. I will pick it up as soon as they have it ready for me. No shipping fee. Hi Christina, I have made French Macaroons before with u tube videos and books in hand. I will definitely give your recipe a go as EVERYTHING you make comes our perfect. I want to say, I bought a silicone mat on Amazon specifically for macaroons meaning circles to show how much to pipe. Mine came out well so there are some mats out there that work great. Hi, What does a macaroon taste like? I have been thinking of trying them as well, but haven’t convinced myself that I will like the taste. I recently made meringue cookies just so I could get the technique down and realized that I really didn’t like them. I may go ahead and make these just to improve my baking skills. Macarons are soft, chewy and crispy all at once. I love them. Maybe buy one from a bakery before deciding to try this recipe? Their flavor mainly comes from the buttercream filling (or whatever you stuff between them), but the actual cookie is soft and delicately almond flavored. Do you have to use Almond flour? Is it a dietary thing? Can you use AP Flour? You may not substitute almond flour for anything else. Macarons are always made with almond flour. Regular flour has gluten and behaves differently in the oven. Sorry! What about gluten free flour? Would it work? There is no flour in macarons, only almond meal. Do not substitute anything else. This post makes me so very happy!!! I discovered that I love Macarons, and I don’t get them often. 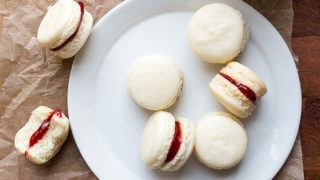 I have a 4 month old baby who is allergic to dairy, so a lot of my favorite desserts are off limits for the time-being, and I figured Macarons were on the list of no-nos! They’re the most incredibly beautiful, delicate dessert, and I never dreamed that I could make them. I can’t wait to try them, thanks to your post! HOORAY! I am a pretty new Pampered Chef consultant who has recently started to enjoy cooking and I’ve been getting more adventurous in the kitchen thanks to having really great tools to work with!! Thanks for your awesome words, pictures, recipe, and encouragement! Keep doing what you’re doing! You can find Wilton meringue powder at Walmart in the cake decorating section of the store. Can we use cream if tarter instead of meringue powder??? Sorry, no. That is a completely different product. You really need meringue powder, which is powdered dried egg whites with a bit of sugar. Can you order online? Do you have to wait an entire week to age the egg whites is there a short cut? Hmmm…good question, Sarah. You really need an older egg white. They just work better for macarons. I’m sorry :( I want you to have success with this recipe, so I recommend aging the egg whites. Tried everything except aging the eggs and sorry to report it failed:( Perhaps I’ll give it another try. My first attempt with another recipe resulted in 1 tray picture perfect and the other failed. Hello..I have been having fun with these..I loved the idea of small batch..my first try..I did not whip the meringue enough..I knew it..as it came out of the tip on it’s own:( No feet..no nothing.. I had to try again as they were devoured last night..
today I overbeat the white.. and again ..I knew it.. Anyway I have made macarons before..my second perfect batch was thanks to you..Merci! I will be posting them..with my photos and a link to here of course. I’ve tried and failed 4 batches of macarons. This recipe might inspire me to try again. How do you know when the almond and sugar mixture is ready for piping? I’ve seen in other recipes that you need a lava/honey like flow to the batter when you lift your spatula. Is your batter thicker? I pipe it immediately after mixing. It has a texture much thicker than honey. It hardly spreads on the sheet at all. It will spread a bit, but not a ton. Hi Christine, have you ever tried to color the batter. With the egg whites instead you substitute the meringue powder Is that right? Nope, it’s correct as written. There’s no granulated sugar in this recipe. And no: you use egg whites AND meringue powder. Is the recipe showing up for you correctly? Christina, you don’t know what you’ve done! I made these little beauties yesterday and had success on the very first try. It was amazing! I live in a place where humidity is a constant problem, and I have never been able to get macarons right before. In fact, I almost didn’t try them because on that day, the humidity was at 80%, but this recipe worked like a charm, yay! I filled them with a very nice chocolate ganache, and they were amazing. Thank you so much for sharing your secrets. YAY, TONYA! YOU DID IT!! I’m proud :) <3 Thanks for giving it a try! Tried this recipe this morning. Easiest of all the macaron recipes that I’ve tried. My macarons looked beautiful in the oven, but then the snag hit once they were out. The top deflated (stayed nice and flat) and were hollow inside. Any thoughts as to what may have caused this? I would hate to be defeated by a cookie! Hi Nicole! It’s Fahrenheit, and 3 drops is about 1/4 teaspoon. Sorry for the confusion! Nice!!! How does this work if we use the Italian Method? The eggs are weighed in grams versus using 1 or 2 eggs? Do we put the meringue powder before the boiled sugar or after once we’ve gotten the stuff peaks? Not sure, Charize. I only made and tested the recipe as you see written here. Your guess is as good as mine. How many grams of egg whites did you use? I failed so many times making macarons. I’m going to try it again with meringue powder. If I want the cookies to be less sweet, can I use less powder sugar? Do not adjust any of the measurements in this recipe or the recipe will fail. It’s very precise. The cookies are not that sweet. The filling is what makes them sweet. Change the filling, if you want. I just finished baking the macarons when I realized I didn’t add the vanilla. When is suppose to be added? I couldn’t find it in the recipe. Where did you get the ‘little brown squeeze thing’? I’ve been terrified of trying to make macarons, but I think I have to give this a go! Your directions and explanations are awesome! What am I missing in the recipe? When do you add the vanilla? Would you recommend adding one tbs. 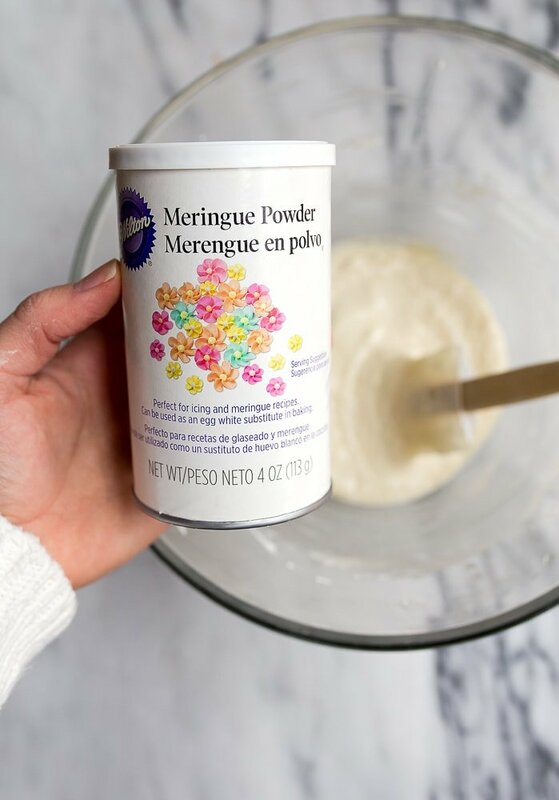 of meringue powder per egg white in any macaron recipe? Thanks. I don’t recommend altering any other recipe, to be honest. Are you looking to scale this recipe up? Hi, Christina. I’m going to try this recipe as written, but looking forward, how does it scale up? Successfully? Or should I think of making in batches instead? Thanks! Hi Kathy! I have not tried it scaled up more than once. It worked doubled, but I really want you to have success! I was actually just looking for a recipe in cups BUT I bought a kitchen scale so I’m going to try yours out since I’ve always had good luck with your recipes. Thanks for responding! What is the size of the egg you use in this recipe. I used 2 medium eggs and the weight was 50 grams and the mixture was too dry. Do you have a weight measurement for the egg white? I always weigh all my ingredients when making macarons because egg white quantities vary with the size of the egg. Thanks! Can’t wait to try these again! Hi, all eggs are size large. Sorry, I should have clarified this! These came out great! I was focusing so much on getting the right mixing of the batter that I forgot to add the vanilla, but it was fine because I made vanilla buttercream. I followed a different recipe last week and they were awful, this was only my second attempt and they were beautiful! What is the weight of the egg whites please? I just googled it and got 30 grams per egg white, so 60 grams total. It sounds right to me. First tIme ever to make macaroons ???????????? Hi Christina. I love the meringue powder tip. i haven’t tried your recipe yet. Really want to. I’ve made macarons before and it is a tricky procedure. Have you added food coloring? If so, liquid or powder? I have found liquid coloring to affect the thickness of the mixture. Thanks for sharing!!!! Hi Patricia! I’ve never actually added food coloring before, but I would use the gel stuff if I were you! As asked previously, when do you add the vanilla? It isnt stated in the directions. So I’ve been determined to make a successful batch of macarons ever since my first attempt was a major fail. I came across this recipe and tried it–first time didn’t turn out too great (I think I underbeat the whites and I added 2 drops of gel food color), but they still tasted good. However, the second time…they were amazing! Delightfully crunchy and soft, and looked perfect! I got so many compliments! This is now my go to recipe. Thank you!! Just thank you! Macarons are my white whale. I’ve tried maybe 20 batches, some better than others, but none as good as your recipe. I live at 7000 feet elevation and I think my meringue needed the extra stabilization. I almost cried when I opened the oven and saw the perfect feet. Thank you for sharing. These worked out great!!! My only concern is that the shells are very weak after you take them out, they don’t have that harder shell that other recipes have given. Am I doing something wrong or is that something you’ve noticed to be the norm? Can you cheat using an aged egg whit by buying pasteurized egg whites and using those?? I’m kind of nervous about leaving a separated egg in the fridge for that long as I’m worried about bacteria that can be introduced from a variety of factors. I’m also curious as to why aging is important. It would be neat to know why. Thank you so much for your hard work. I love your website and I think I will try out a recipe tomorrow morning or the next. I love the small batches and I like that you have both regular and healthy options. Can you store the macarons in the freezer w/ out the filling yet? When do you add the gel food color if I want to use one? I haven’t tried to freeze them, I’m sorry! Add the gel after the dry ingredients are incorporated and fold to combine. Hi, I commented earlier about the Meringue powder and I’m finally going to make these. I am making them for a small bible study meeting my rents are having. I have made macarons before using various recipes and I’ve noticed that they say to beat egg whites until stiff peaks form. Is there a reason that you beat until soft peaks (does it help or something. If that makes any sense) form? Thanks again. Is the meringue powder a substitute for cream of tartar ? I’ve never used the meringue powder, i think i should try it since everyone is to happy about the result !! No, it’s powdered egg whites and cannot be substituted for anything else. I’m going to say I was seriously dissapointed when I made these. Mostly because they were grainy. Skipping the processing of the almond flour and sugar was a huge issue for me. They were not pretty at all. ???? So, you didn’t process the almond flour at all? I’m confused. I’m sorry you had trouble with this recipe. Hi, I noticed that your recipe doesn’t have the sugar that is beaten with the egg whites that all the other macaron recipes have that I’ve read, and instead replaced it with the meringue powder. I am hoping this willl work for me because I find the other ones too sweet. YESSSS. I have a great macaron recipe, but the yield is crazy! I can’t wait to try this out – I’m making a cake and am planning on decorating the top with macarons. Thank you! Do you think I can use egg whites out of the cartoon? According to the cartoon, 1/4 of a cup is equal to an egg (serving size on carton: 60g per 1/4 cup). I’ve tried several times and have failed, they come out looking beautiful but hollow so I decided to try your tip with the meringue powder. Well they come out exactly the the same way, beautiful but hollow in the inside! ???????? Can the meringue powder be replaced with cream of tartar? So excited to make this! It cannot. Meringue powder is powdered egg whites. Cream of tartar is an acidic compound used for stabilizing egg whites. Completely different things. I’m sorry! Why do you not use any sugar in your meringue portion of the recipe ? Just curious why the omission since almost all macaron recipes call for sugar to be added to the meringue. I’m all for lower sugar content but wanted to know if this also lends to better success with your recipe? Thanks for this tip I will try it. thank you so much for blog post. i tried this out lastnight and i was VERY HAPPY. my shells cracked but that was all on me. the first batch i made (not your recipe) broke during folding and i was too tentative when i was doing this recipe. will be using this again. Thank so much! Thanks for sharing with us. It’s an awesome recipe and the way you described was super easy to follow. I have been doing a happy little dance around the kitchen singing ‘We’ve got frilly feet, we’ve got frilly feet!’ Thank you for the foolproof recipe and the amazing tips and tricks. I have found THE recipe that I ‘ll go back to time and again. I’m sorry, but I have no idea :( I would imagine there’s a temperature adjustment…have you google ‘high altitude macarons?’ I want you to have success! Why is this recipe partially in grams and partially in U.S. measurements? Just read your article, and I’m so glad you mentioned the meringue powder. This was my first time ever to make macarons and they turned out so perfectly! Thanks so much for the tip! Public service announcement… merainge powder goes bad. While aging your whites is good, you should fork out the couple bucks for a new jar each year. I can’t wait to try this small batch recipe. But I am curious about flavoring the small batches. I have always wanted to make these! They are my favorite cookie ( of course ,my favorite is the most expensive) I am re pinning this so I can try this out soon! thanks for the tips! much to use and how it might change the consistency of the batter. If I did the full recipe I wonder if the batter can hang out while the first batch bakes in my shoebox oven. I have made macarons several times; some have been disaster, some good, a couple really good. Never perfect, so I’m excited to try this recipe! One question though, pistachio macarons are my favorite, but I’ve never made them myself. Can I just substitute the almond flour with pistachio flour? I’ve seen recipes that do that, I just haven’t done it myself. I haven’t tried that, but if you do and it works, let me know. I would love to make pistachio ones! HI Christina! Can I substitute powdered sugar with icing sugar? Will it work better because of the starch?? Thanks for all your valuable tips! I’ve tried making macarons a few times. While they always come out delicious with buttercream frosting, the requisite feet are elusive. I’ll try your method but first I need to get some meringue powder. I think that may just do the trick. Btw, having lived in Paris, I think the French do say “macarons.” It’s just that they nasalize the last syllable and the “o” sounds longer. Thank you for passing on your secret. I had some success with these on the first try with one issue. They were hollow! They looked great but the insides were hollow as if only the shell rose up. Any idea what I did wrong??? Would I be able to replace the powdered sugar with powdered Swerve (erythritol)? Definitely not. Erythritol is a chemical that does not behave the same was as powdered sugar, I’m sorry. I don’t want you to have a recipe flop. Try googling ‘keto macarons’ and see if you can find a different recipe.